We are your source for all kinds of information about Roy Rogers, Dale Evans, Trigger, the Sons Of The Pioneers, and more! From the late 1930s to the late 1950s Roy Rogers’ presence touched us from movie screens, television screens, radio and records, and in countless personal appearances all over the country. Born Leonard Franklin Slye in Cincinnati, Ohio in 1911, Roy Rogers came to personify America’s quintessential good-guy cowboy hero, our very own King Of The Cowboys. Dale Evans was well known for many things, including her singing, acting, writing, love of children, Christian evangelism, and her famous husband Roy Rogers. Together with Roy she became a beloved American icon, a Western superstar heroine who endlessly entertained us on movie and television screens and as a singer. Though her personal life was frequently touched by tragedy, she remains an enduring symbol of love, faith in God, and courage. It seems like there was a time when there wasn’t a child in the world that didn’t instantly recognize the name Trigger. He was a cowboy’s best friend, a high rearing, fast running superhero that could shoot a gun and untie ropes. 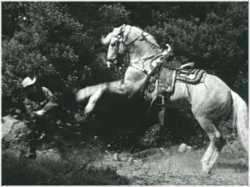 Trigger was a horse, officially known as The Smartest Horse In The Movies, and he belonged to the King Of The Cowboys himself, Roy Rogers. The Sons Of The Pioneers were a Western singing group founded by Roy Rogers, Bob Nolan, and Tim Spencer. They were wildly successful on the radio, making recordings, and in personal appearances. 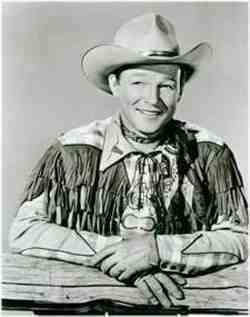 They also starred with Roy Rogers in many of his movies. 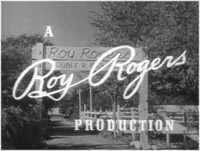 Roy Rogers and Dale Evans branched into television in 1951 with the highly successful “The Roy Rogers Show.” The show starred Roy Rogers and his horse Trigger, Dale Evans and her horse Buttermilk, Pat Brady and his Jeep Nellybelle, and Bullet The Wonder Dog.